The Colorado River Chef’s Food Fest will be held in the Pavilion Ballroom at the Aquarius on Thursday, June 7 at 5:30 p.m. The annual friendly evening competition features chefs from food and beverage departments at the Laughlin resorts and local restaurants, along with food and wine distributors. Tickets are $75. 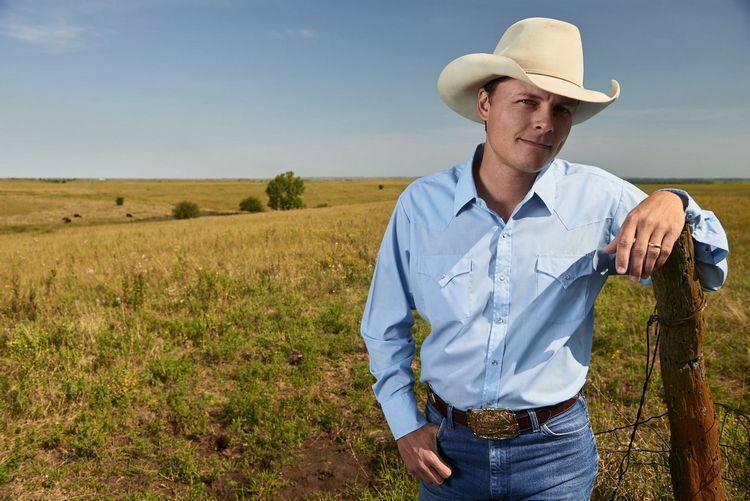 American country music singer and songwriter, Ned LeDoux, and son of singer-songwriter Chris LeDoux who passed away in 2005, will headline at Don’s Celebrity Theatre Thursday-Saturday, June 21-23 at 8 p.m. Tickets are $30. LeDoux has a new goal to keep his father’s name and music legacy alive. Audiences are guaranteed to hear “This Cowboy’s Hat,” the song most requested. His personal favorite song to sing is “We Ain’t Got It All.” It’s the first original song father and son co-wrote. Legendary rock group YES, true pioneers of the music genre, is celebrating its 50th Anniversary with a North American tour titled “#YES50: Celebrating 50 Years of YES.” The band will stop at the Edgewater’s E Center on Saturday, June 23 at 8 p.m. Tickets start at $45. Guitarist Steve Howe says the anniversary tour will encompass some of YES’ best-loved works as well as a few classic pieces not exposed for a while. During this summer’s YES shows, members Steve Howe (guitar since 1970), Alan White (drums since 1972), Geoff Downes (keyboards; first joined in 1980), Jon Davison (vocals since 2011), and Billy Sherwood (guitar/keyboards in the 1990s and the late Chris Squire’s choice to take over bass/vocals in 2015) will perform their special classic hits concert to commemorate the landmark occasion. Summer is a time for outside fun. 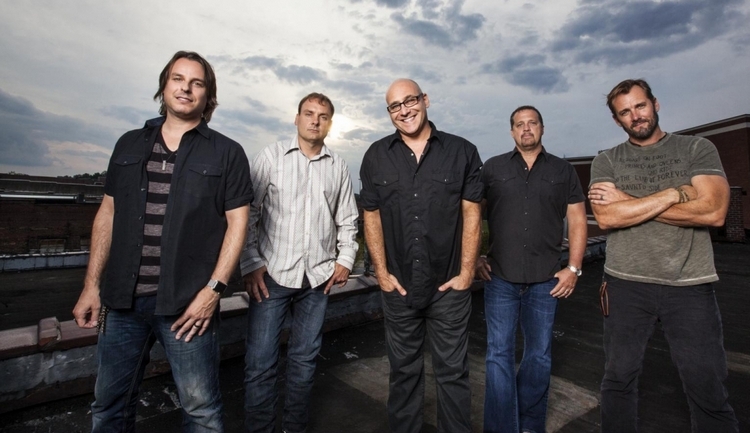 At Harrah’s the Beach Party Concert Series has lined up Sister Hazel for Saturday, June 30 with a 10 p.m. show. The band will be playing tune favorites, such as “All For You,” “Your Winter,” “Mandolin Moon,” “That Kind Of Beautiful,” “Karaoke Song,” and more. A DJ will kick off the evening with doors opening at 8 p.m. There are a few driveway entrances to the Tropicana. The main entrance is at the stoplight which is used for both the Tropicana and the Colorado Belle. This entrance will take you to the valet, and if you continue past the valet area it takes you to the garage. The garage entrance is closest to the Promenade Tower, which is 21-stories and the family tower. This is the tower set farthest from the Strip. Please note that it is a long walk from the parking garage back to the reservation desk to check in. You should either valet or park in the outside lot by the valet/side entrance before bringing in your luggage. Check in and find out which tower you are in, and then move your vehicle to the garage if you are located in the Promenade Tower. Speaking of reservations, if you book through the hotel’s website, TropLaughlin.com , the Wi-fi is free! Otherwise, they will charge you $7.99 for Wi-fi. Also, there is always free Wi-fi throughout the casino and in their bar areas, pool and dining outlets. You can request a refrigerator for your room; however, they do charge a fee ($11), and based on the volume of requests one might not be available, especially in the summer. Coolers are always your best bet in the room since you can always get free ice. This is not a pet-friendly property; they do not allow any pets; so you would have to board your pet during your stay. There are only a few hotels that allow pets in town. Another driveway entrance is right before (if you are coming from the north) the In and Out Burger, fast food restaurant. By the way, In and Out features good burgers, great fresh fries and an ice cold Neopolitan shake. The Neopolitan shake is just one of the items that is not on their menu. 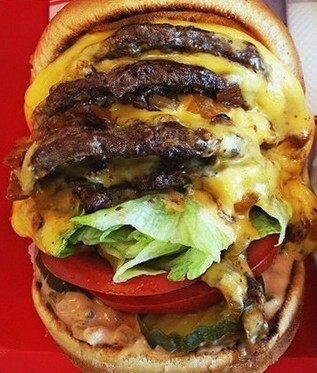 It is one of those “secrets” that In and Out Burger fans know about and only have to ask to get one! More secrets? You can order 3×3 (triple-triple) or 4×4 (quad-quad) burgers which are, you guessed it, triple patty or quadruple patty burgers with all the fixings, including that many slices of cheese. But I digress. If you want to park outside by the Tropicana hotel ‘s valet/side entrance, you should continue straight past a couple of In and Out restaurant parking rows, and the parking lot is to your left. The registration area is closest to this lot. The 12-story Casino Tower (adults 21+), which is closest to the strip, is also most accessible from this parking lot. There is also an entrance just south of the hotel which is also used for those leaving the garage from the back exit, for deliveries and for bypassing the valet area and the stoplight. 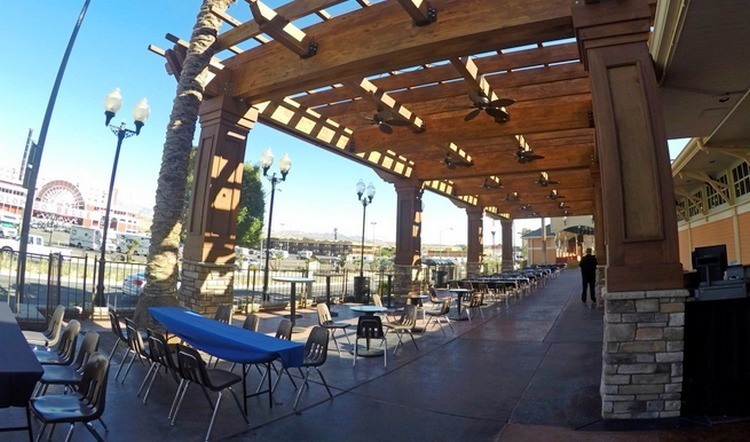 The Tropicana has a variety of restaurants and bar/lounges, such as the Grand Junction Bar and the Eclipse Bar. They also have a buffet, which can be hit or miss, and Carnegie’s, which is their 24-hour café and is good. Their steakhouse (named The Steakhouse) was a Best of Dining winner by Casino Player Magazine in 2017. 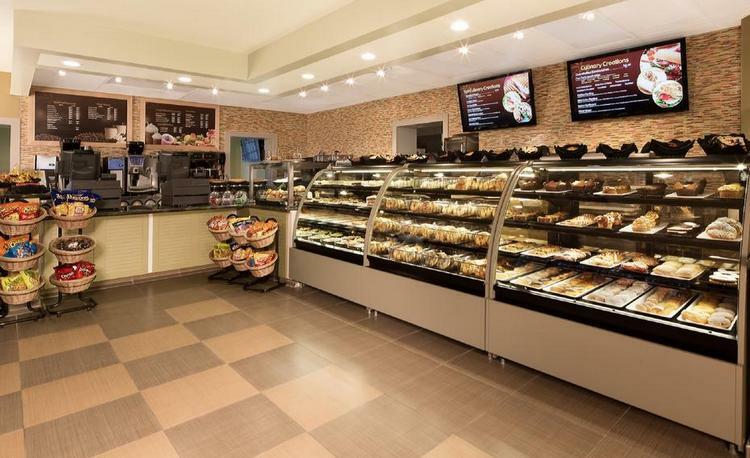 Their Poolside Café is also pretty good with a good variety of sandwiches and pastries. It’s nice to buy a pastry and coffee and sit poolside in the morning, or, take it out to the Terrace at the front of the hotel by the Strip. By the way, did you know the pool is in the shape of a train? Do you see the smoke stack? The pool is located between the hotel towers and easily accessible. Although the bingo room is very large, it is currently being remodeled. It has both smoking and non-smoking sections. They have relocated the bingo into a smaller room by the Buffet until renovations are complete. 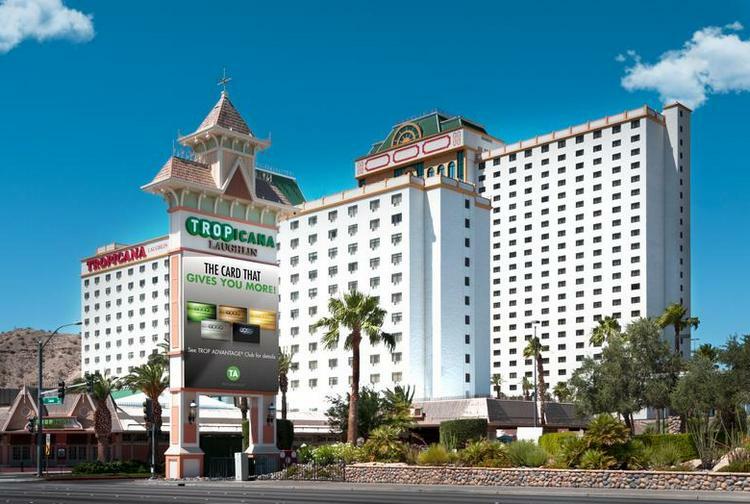 The nice thing about the Tropicana is it is located away from the hustle and bustle of the other hotels and the riverwalk. While it is nice to be directly on the river, sometimes it is enjoyable not to hear the screeches, screams, music, vehicles, and planes (emanating just across the river in Bullhead City) to get a better night’s sleep. If you request a higher floor in the towers you can see the whole Strip area and portions of the river, provided you are facing east. Now that you are finished at what I like to call “the island hotel” (Tropicana), you can go explore the other side of the Strip again! Going back to the Aquarius as a starting point, we can continue down the riverwalk and Strip to a teeny, tiny casino located between Aquarius and Edgewater. The casino is The Regency, and though it does not have hotel rooms it does have a fantastic restaurant with a river view, The Chuckwagon (which replaced Daniel’s). The new restaurant opened the beginning of March and has kept the same specials, while removing menu items that were not as popular. So you want specials? Let’s start with my favorite, Burger Wednesday. Burger’s on Wednesdays are ½ off! Yes, 50% off! And every time I have been there the burger was delicious, no matter which one of the 19 varieties that I ordered. They also have a pasta special on Thursday’s beginning at 2 p.m. and a good, all-you-can-eat fish fry for $11.99 on Friday’s, which includes beer-battered cod fish, fries and slaw. When was the last time you had an all-you-can-eat fish fry? Pretty rare these days! 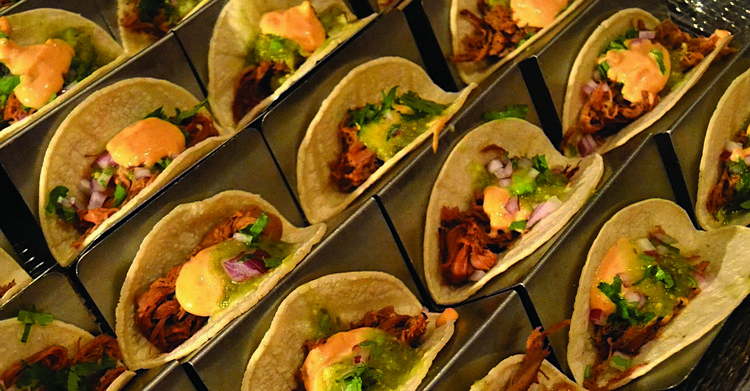 And, Tuesdays are Taco Tuesday. They have a slate menu board by the restaurant entrance listing the taco choices with prices starting at $1.75 up to $3.99 each. 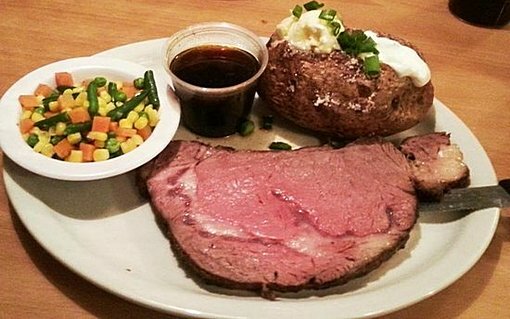 They also offer a prime rib dinner Thursdays through Sundays starting at 4 p.m. with a regular size and king size steak (which is huge and covers your plate). You should at least try the restaurant once while in town for one of their specials to see what you think. Oh, you say you can’t find The Regency? It’s mustard yellow. It’s small. It can easily be mistaken for a convenience store or small house, depending on which entrance you are looking at — and there are 2 entrances. 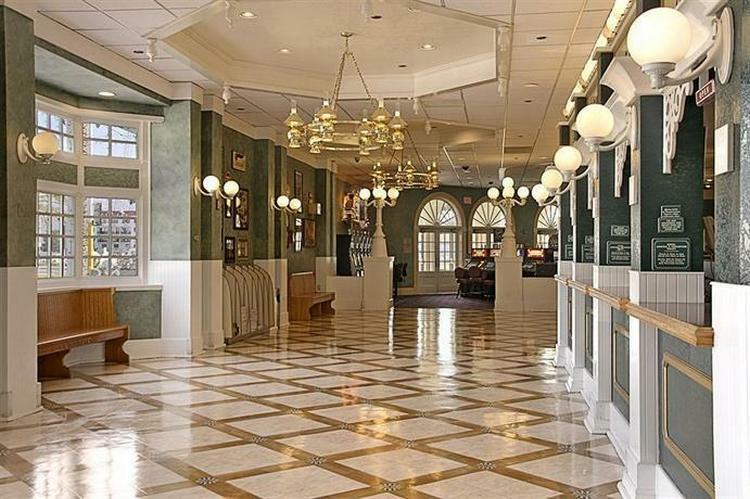 From the riverwalk, The Regency entrance is in their gift shop/convenience store on the bottom floor. To get to the casino you take the elevator, which is to the right once you get inside the main entrance. If you miss the elevator … well, you shouldn’t miss the elevator because it has a red door with a huge “up” arrow stating “CASINO” on it. If you are traveling on the Strip, the entrance is set far back from the road. 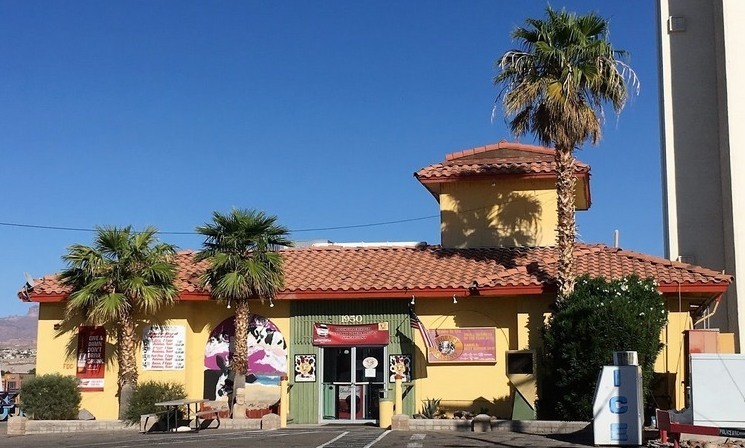 The building is right at the river, so you would see a very long parking lot from the Strip. If you are leaving Aquarius at the stoplight, the entrance driveway is three driveways on your left. The Regency Casino sign is between two of the driveways, exit and entrance. There is no stoplight at these driveways. The entrance and parking lot is in between the Aquarius parking garage and the Edgewater garage. It is also straight across from the Outlet Mall main entrance driveway. The Strip entrance actually takes you into the casino/restaurant portion of the building and is at 2nd floor level! You can also check out the photos so you can find how to get in from either entrance. And The Regency also has a bar with video poker and keno, slot machines, pool tables … and a cow. It has a lot in a little building. Note: In case you have not already heard, The Pioneer Hotel & Casino changed owners as of May 1st. While the hotel, restaurants and bar are still open, the casino portion of the property and gambling at the bars is no longer an option. 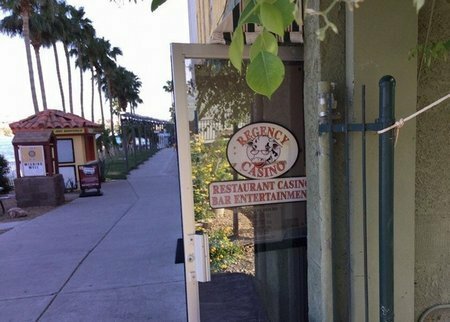 The new owners are working on getting the gambling license transferred to Laughlin. Since they did not lose the license, which would normally take anywhere from 6 to 12 months to obtain, they should be running again within a few months. 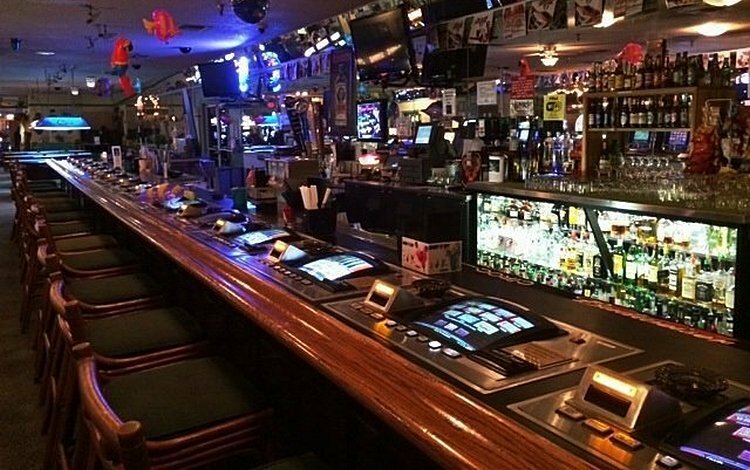 So please continue to stop in and enjoy Bumbleberry Flats for a super good and huge meal, Sassy Sue’s bar for a libation and talk with the employees to help them work through the transfer. We hope they will be up and running at full capacity soon! Coming in July … Edgewater and Colorado Belle!